FLORHAM PARK, N.J. - The "Big Cat" is thrilled to be near the Big Apple. Fresh off his first-round selection Thursday night in Chicago, USC defensive end Leonard Williams was in New Jersey on Friday afternoon holding up his new Jets jersey with "No. 1" and his last name stitched in gold on the back. His hard work had culminated in one special moment for the 20-year-old, whose father, Clenon, is serving time in the Marion Correctional Institution in Ocala, Florida, for several offenses, including robbery with a deadly weapon. "Me and my dad still have a great relationship even though he's incarcerated," Williams said of his father, who was sentenced in 2012 and is scheduled to be released Nov. 1, 2019. "Actually, because of good behavior, they allowed him to have a cellphone or something like that and we're able to talk a lot." 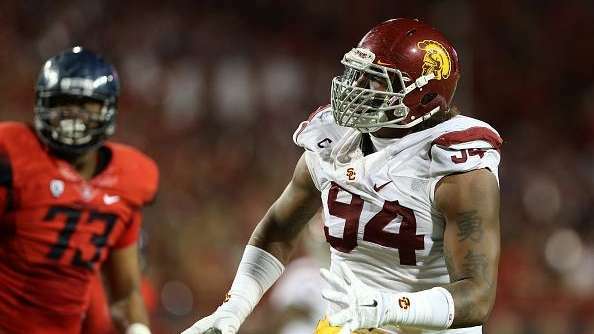 It's been a long journey for Williams, arguably the best player in this year's draft class, who fell to the Jets at No. 6. He's lived all over the country, from Bakersfield and Sacramento, California, to Michigan, Arizona and later Daytona Beach, Florida, where he attended Mainland High School. Some nights he even slept in homeless shelters. He still remembers being a 13-year-old Pop Warner hopeful who was turned away at the sign-in table because he weighed 200 pounds -- 20 over the limit. The disappointment of that day still resonates, Williams said. But now he's on the cusp of a new beginning. "It's almost unreal to finally be in this position," said Williams, who has a 2-year-old daughter. "I feel like time has gone by so fast . . . It felt like yesterday that I was playing high school football." And now that he's in the NFL, he's anxious to wreak havoc on quarterbacks in Todd Bowles' defense. His preference is to remain a defensive end, but Williams insisted he's just happy to be a part of the Jets' vaunted defensive line. Currently, that line is a crowded place with Muhammad Wilkerson, Sheldon Richardson and Damon Harrison. But even though they didn't need another defensive lineman, the Jets wanted Williams because of his athleticism, physicality and passion for the game. Smith second-round pick. The Jets targeted speed in Round 2 with the selection of receiver Devin Smith of Ohio State. He has game-changing quickness and can stretch the field. The Jets traded their 70th pick to Houston and got back receiver DeVier Posey, plus the Texans' picks at No. 82, fifth round (152) and seventh round (229). The Jets used the 82nd pick on Louisville outside linebacker-defensive end Lorenzo Mauldin, who fought back tears during his conference call. "I'll do whatever I have to do to get to the quarterback," the 22-year-old said, choking up. "I'm going to show 'em what I got." He referenced many doubters in his past, an upbringing that included 16 different foster homes.